Home of the biggest Bat Colony in Pennsylvania! Canoe Creek State Park is nestled in the Pennsylvania Mountains yet uniquely located only 12 miles from Altoona. Explore this popular PA State Park and enjoy unique family educational bat hikes and many other educational programs throughout the summer. With 8 miles of Hiking Trails, a beautiful Sandy Beach, and Mountain Cabins, you can spend the day or a week. It's only a few miles from Altoona or 10 miles from Historic Hollidaysburg if you'd like to spend some time in the city, or stay in one of the many hotels. When cresting the hill on Canoe Creek Road you'll suddenly experience a panoramic view of the beautiful lake, mountains, and scenic trails. Although it is one of our smaller modern PA State Parks, it is also one of our newest. With 958-acres of vast openness, along with a 155-acre lake, there are a lot of outdoor activities to enjoy year round. Canoe Creek State Park was built in 1979. The beautiful Sandy Beach is 350 feet long with a large grass area to spread your blanket and enjoy the sun. Umbrellas are available to rent for those that aren't sun worshipers. There is an exceptionally nice Playground area for the children that is small enough to play with other children or interact with their parents. You'll also find a nice, clean, convenient Bathhouse with Showers and Private Dressing Areas. The Snack shop offers a cement area with Tables and Umbrellas that is located on the beach. Your family can enjoy a snack or a meal. You'll find some picnic supplies and souvenirs inside the Snack shop. The boating area has a Boat Launch on each side of the lake. Rowboats, Paddle boats, Canoes, and Kayaks are available to rent by the hour or by the day. Canoe Creek State Park truly is a unique Pennsylvania State Park that your family will want to explore and spend many long summer days and evenings. The 155 acre lake is a fisherman's paradise. Stocked with many types of Panfish, Walleye, Trout, Bass, and Catfish, just to mention a few. Many of the locals enjoy fishing year round. Although Canoe Creek State Park don't offer camping sites, like many other PA State Parks, there are 8 modern cabins that overlook the beautiful lake. They are available to rent year round for activities like Ice Fishing, Ice Skating, Cross Country Skiing and Hunting during the winter months. If you are looking for a place to go camping we have many wonderful PA State Parks with campsites at Prince Gallitzin State park , named after a Catholic Priest that was once a Russian Prince. Or take scenic drive to Bedford County and check out Shawnee State Park , named after the Shawnee Indians, it's within an hours drive from Canoe Creek State Park. There are two road that lead into Canoe Creek State Park. The first road, is the most popular since it leads to the beach and picnic area. The second road travels behind the lake and is most popular for the fishing area. There is also a really nice picnic area. 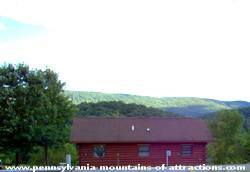 This little PA State Park offers more than the eye can see! When you travel down the second road you will pass a Small White Church that looks insignificant as far as a roadside attraction. 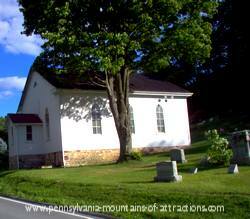 Yet, this small church is a very popular focal point in Pennsylvania. It is the home of about 20,000 bats. The church was built in the 1800s. The Wild Resource Conservation Service built, what is known as, a Bat Condo in the same area. This was to provide an emergency refuge for the bats if anything would happened to the church. The PA State Park contains an abandoned limestone mine that is used by as many as 25,000 hibernating bats each winter. Six species have been seen in the mine, including the Indiana Bat. The Indiana Bat are an endangered species. Mixed with the Little Brown Bats, the female bats nurture their pups in the church. Your family would really enjoy taking the annual Bat Hike at Canoe Creek State Park. Experience watching the thousands of bats fly out at dusk to enjoy their evening feast. Be sure to bring along a flashlight and a hat would probably make you feel more comfortable. Besides the study of bats you can also enjoy studying other programs that teach about Bluebirds, Bird Nests, Frogs, Toads, and Wildflowers. Take some time to explore this unique PA State Park and give your family an interactive education. 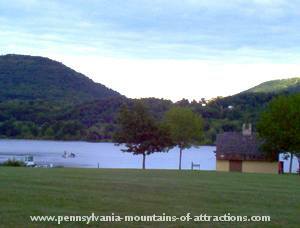 Visit other PA State Park located throughout the Allegheny Mountains. 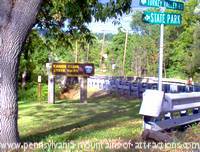 Every time you visit a Pennsylvania State Park you'll discover something unique.